This summer we are continuing our TL and CIT Adventure Camping Trip. In order to determine the fee for the camping trip, we need to know how many TLs and CITs will be participating. Currently, we are basing the fee on 20 TLs and CITs total. Based on 20 TLs and CITs, the fee is $160.00 for the trip for TLs and CITs registered for Week 4 of camp and $260.00 for TLs and CITs not registered for Week 4 of camp. The fee includes the costs for transportation, gas, tent rentals, campground, food, and the Gunstock’s Aerial Treetop Adventure (ATA) course. If we have numbers less than 20, the fee may increase based on the numbers enrolled. The TLs and CITs will depart Camp Hadar on Wednesday, July 18th by bus and travel to Gunstock Campgrounds in Gilford, NH. 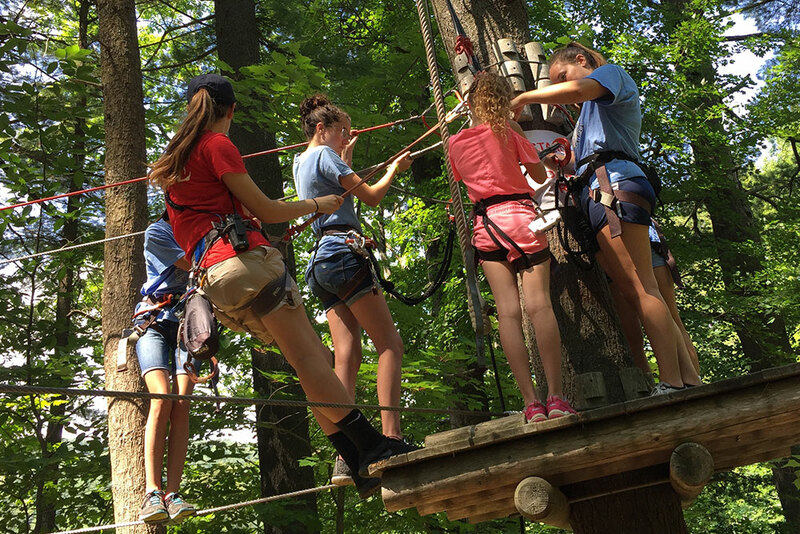 On Thursday, July 19th, the TLs and CITs will participate in an amazing adventure program, the Gunstock’s Aerial Treetop Adventure (ATA) course and Mountain Activity Pass. The Gunstock’s Aerial Treetop Adventure (ATA) course is an adventurous obstacle course set in the wooded area along Gunstock’s pond. The obstacles and games are suspended between trees and participants stay securely clipped into a safety cable throughout the course. The obstacles you will find during your adventure include 91 challenges, 8 courses, 12 zip lines, suspended bridges, scramble nets, swinging logs, and much more. The fee includes approximately 3-4 hours of treetop adventure, including a training session and equipment familiarization. For more information about the ATA, click here. After their day at Gunstock, we will return to the Gunstock Campgrounds for dinner, campfire, and lights out. On Friday, July 20th, a bus will pick us up at Gunstock Campgrounds at approximately 10am to return to Camp Hadar for lunch at approximately 12:30pm. If you have any questions, please email us at info@camphadar.org. $160.00 for TLs and CITs registered for Week 4 and $260.00 for TLs and CITs NOT registered for Week 4. Please Note: Fee is based on 20 campers and is subject to change if there are less than 20 campers registered for the Adventure Trip. Open to ALL Teen Leaders and CITs registered for camp anytime during the 2019 season.